Ursa Major is one of the most well known constellations in the heavens. It contains the famous grouping of stars known as the Big Dipper, which is often the first group of stars learned by people in the northern hemisphere. Several other "firsts" are associated with this constellation; the star Mizar was the first double star to be discovered through a telescope (1662), the first star to be photographed (1857), and the first star to be identified as a spectroscopic binary (1889). Also, the star Xi UMa was the first binary star to have its orbit calculated (1828). As Ursa Major lies away from the obscuring dust of the Milky Way, many galaxies are visible in its confines, and several of these are large and bright in amateur instruments due to their relative closeness. A whole night's observing can easily be spent in this large constellation. Callisto was the splendid Princess of Arcadia who captured Zeus' heart, and gave birth to his son, Arcas. Seething with jealousy, the Queen of Gods, Hera, unleashed her mighty wrath and transformed Callisto into a bear, doomed to prowl the forests forever. Years later, while Arcas was out hunting, the vengeful Hera brought Callisto before the young man as prey. While Arcas unknowingly prepared to kill his mother, Zeus swiftly stepped between them and sent Callisto soaring into the heavens to become Ursa Major, The Greater Bear. 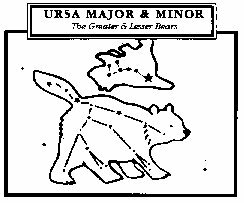 Later, the King of the Gods placed Arcas in the sky to be forever known as Ursa Minor, The Lesser Bear, reuniting mother and son for all time. Ursa Major, also called the Big Dipper, is the best known constellation in the northern sky. M-81 - This is a large and beautiful spiral galaxy, 10' long and 4' wide, oriented NNW-SSE. It has a bright core with a stellar nucleus, and spiral arms can be seen, especially with averted vision. M-82 - One of my favorite objects! This peculiar galaxy is 10'x2-3', oriented NE-SW. It has slightly tapering ends, and a great amount of mottling across its length can be seen. The southern edge appears flatter, and it seems to be "pinched" near the center on this side. Fascinating. M-97 - The Owl Nebula. This large planetary nebula is almost 3' in diameter, and appears as a gray puff of light, slightly brighter in the center. At times, especially with averted vision, the "eyes" of the owl can be seen as two slightly darker spots. M-101 - A large face-on spiral galaxy with low surface brightness. It is about 7' in diameter, with a brighter core surrounded by an envelope which sometimes can be seen to be spiral arms. M-108 - Large, about 10'x3' extended ENE-WSW. This galaxy has an evident central bulge, a stellar nucleus, and tapering ends. The western end appears to be tapered more than the eastern end, and dark markings are seen along its northern edge. M-109 - 8'x4', oriented ENE-WSW, with a faint stellar nucleus. Spiral arms can be seen leading to the north and south. NGC 2841- A very pretty galaxy. 7'x2-3', oriented NNE-SSW, with a sharply brighter core and stellar nucleus. Dark markings can be seen, especially east of the nucleus. NGC 3079 - Fascinating. 6'x2' with an obvious central bulge and extended N-S. Broadly concentrated to the center with pointed ends. At times, the ends appear curled: the north end to the west, and the south end to the east. Very pretty. NGC 3631 - Large and impressive, this galaxy is roughly circular and 5' in diameter. The core is about 1' in diameter and has a stellar nucleus. Averted vision shows arms spiralling from the north to the east. Alcor and Mizar - Alcor and Mizar, zeta Ursae Majoris, are a visual double found in the handle of the Big Dipper. Easily seen with the naked eye - if you have good vision - this famous double was often used by American Indians as a test of visual acuity. Try it out for yourself. 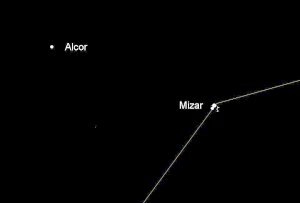 In a telescope, you will see that not only are Alcor and Mizar a pretty double on their own, but Mizar in itself is also a double star, making this a triple star. 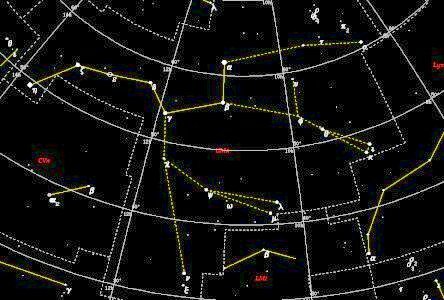 Alcor and Mizar, however, are visual binaries, meaning that this is a chance arrangement of these stars in the sky. Mizar and its visual companion, however, are a true double star system. Mizar is again a spectroscopic binary, but its closer companion cannot be seen with an optical telescope. Photos © Copyright Edward P. Flaspoehler, Jr. Sponsored by the American Association of Amateur Astronomers. EDITOR: Edward P. Flaspoehler, Jr.
Help support the development of the Constellation Home Page. Become a member of the American Association of Amateur Astronomers. the American Association of Amateur Astronomers! 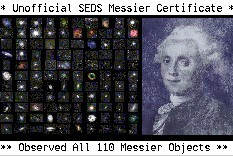 Astronomy News and Special Publications. Club Discounts on Astronomical Publications.